Mateo Manaure attended the Escuela de Artes Plásticas y Aplicadas in Caracas. In 1947, he was awarded the Premio Nacional de Artes Plásticas and received a scholarship to study in Paris. Up to that point, his painting had portrayed traditional subjects painted in an expressionist style. On his return to Caracas he founded with others the Taller Libre de Artes (1948) before returning to the French capital again, where he practiced Surrealism and illustrated Oswaldo Trejo’s book Escuchando al Idiota (1949). 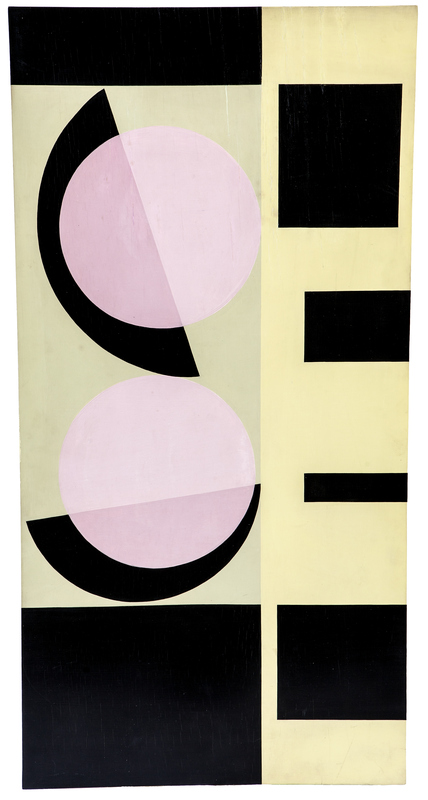 In 1950, Manaure co-founded Los Disidentes, a young group of artists and intellectuals living in Paris who rebelled against Venezuela’s stagnant cultural values and promoted a movement of aesthetic reformation that resulted in the development of abstract-geometric art. Once again in Venezuela, he organized the collective exhibition Primera muestra de arte abstracto (Galería Cuatro Muros, Caracas, 1952) and participated in Carlos Raúl Villanueva’s project at the Ciudad Universitaria de Caracas contributing several works, including Bimural for the Plaza Cubierta (1954). His first stage of abstract geometric works culminated with an exhibition at the Museo de Bellas Artes (Caracas, 1956), which included a selection of paintings that showed his passion for the characteristics of color. Experimenting then with the subjective language of lyrical abstraction, Manaure again took up figurative painting in works of imaginary and poetic landscape visions he called Pinturas sobremontaje, which in some cases combined photographic collages. He exhibited these works at the Sala Mendoza (Caracas, 1962, 1965 and 1967). This stage ended the series Suelos de mi tierra y selva, psychic landscapes characterized by rarified atmospheres without clear references to nature. Manaure revisited geometric abstraction with a series of serigraphs titled Cuvisiones, comprised of optical effects emanating from orthogonal patterns of cubes, and chromatic contrasts that gave an illusory sense of vibration and volume. He used these Cuvisiones to illustrate a storybook written by Arturo Uslar Pietri, and he exhibited them at the Sala Mendoza in 1969. Cuvisiones inspired the development of new visual experiments in which the Manaure created structures and spaces that departed from virtual painting. In 1977, he displayed his Columnas Policromadas at the Museo de Arte Contemporáneo de Caracas, a series of compositions in which color, arranged in vertical strips, contributed as much to volume and movement of the work as to its lyricism and mystery. The pictorial character of these works did not prevent the viewer from compreheding their sculptural and architectonic qualities. At the beginning of the 1980s, Manaure entered a new figurative stage. At this time, social subjects as well as a personal interest in pre-Hispanic symbols and myths predominated in series such as Mirar a América (1981), Orinoquía (1989), and Ofrenda a mi raza (1992), and others. In 1996, Manaure presented the exhibition Saludo al tercer milenio (Galería Muci, Caracas), in which, once again, he demonstrated his abstract-geometric vocation. Mateo Manaure lived and worked in Caracas. Ciudad Universitaria de Caracas- Campus of the Central University of Venezuela, which was designed by the architect Carlos Raúl Villanueva. Construction began in 1944 and the campus was formally inaugurated in 1954, although works were ongoing for a long time after that. Villanueva developed within the boundaries of this masterpiece of modern architecture his personal vision of the Corbusian idea of a “synthesis of the arts,” according to which man and his active involvement (rather than a simply expectant attitude) are the main links between architecture, sculpture and painting. In his project, Villanueva worked with Jean Arp, Alexander Calder, Armando Barrios, Omar Carreño, Carlos González Bogen, Henri Laurens, Fernand Léger, Mateo Manaure, Francisco Narváez, Pascual Navarro, Alejandro Otero, Víctor Valera and Victor Vasarely, among others. Los Disidentes- Los Disidentes was a group of young Venezuelan artists and intellectuals that was founded in 1950 in Paris, around Alejandro Otero. Through a publication of the same name, members attacked Venezuela’s mainstream culture and promoted an aesthetic renewal movement that led to the establishment of abstract-geometric art in the country. Otero was from the start backed by: Pascual Navarro, Mateo Manaure, Luis Guevara Moreno, Carlos González Bogen, Narciso Debourg, Perán Erminy, Rubén Núñez, Dora Hersen, Aimée Battistini, Belén Núñez and J.R. Guillent Pérez. Soon afterwards, they were joined by Armando Barrios, Omar Carreño, Genaro Moreno, Oswaldo Vigas and Miguel Arroyo, among others. Sardio- Group launched in 1957 by Venezuelan intellectuals who had the urge to fight a cultural atmosphere that they regarded as complacent and petty. They suffered repression at the end of the Marcos Pérez Jiménez dictatorship, but after that regime fell in 1958 they started publishing a magazine of the same name. The group featured mainly writers (Guillermo Sucre, Adriano González León, Salvador Garmendia, Rodolfo Izaguirre, Luis García Morales, Elisa Lerner, Edmundo Aray and Francisco Pérez Perdomo, among others), but also painters (including Manuel Quintana Castillo, Mateo Manaure and Carlos Contramaestre). In 1961, internal political differences led the group to break up, and its most radically leftist wing gave rise to El Techo de la Ballena.